Perched peacefully on a hillside, these white, sunbathed villas feature spacious private terraces with views of the dramatic volcano . 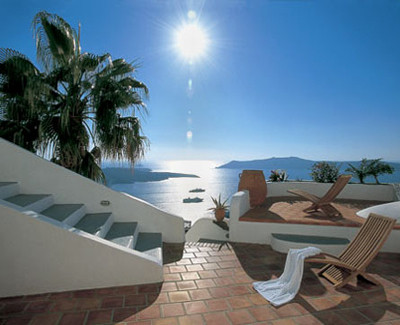 . .
Perched peacefully on a hillside, these white, sunbathed villas feature spacious private terraces with views of the dramatic volcano, the deep blue Aegean, and the beautiful sunsets on the island of Santorini. Designed in traditional style, the 23 studio and one-bedroom apartments offer fully-equipped kitchenettes, king-size beds, and beautiful local accents. Bathe in the clear waters of the Aegean, or lounge by the swimming pool enjoying cocktails and freshly prepared dishes from the poolside bar. On-site services include daily cleaning, laundry, grocery delivery, tourist information, and arrangements for exotic local dining.